Crickets, like all other insects, are cold-blooded. They take on the temperature of their surroundings. Many characteristics of cold-blooded animals, like the rate at which crickets chirp, or the speed at which ants walk, follow an equation called the Arrhenius equation. This equation describes the activation energy or threshold energy required to induce a chemical reaction. For instance, crickets, like all other organisms, have many chemical reactions occurring within their bodies. As the temperature rises, it becomes easier to reach a certain activation or threshold energy, and chemical reactions, like those that occur during the muscle contractions used to produce chirping, happen more rapidly. As the temperature falls, the rate of chemical reactions inside the crickets' bodies slow down, causing characteristics, such as chirping, to also slow down. Crickets mate in late summer and lay their eggs in autumn. The eggs hatch in the spring and have been estimated to number as high as 200 per fertile female. Species Acheta domestica however lays eggs almost continually, with the females capable of laying at least twice a month. Female crickets have a long needlelike egg-laying organ called an ovipositor. 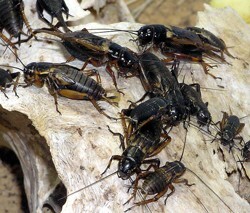 Call Knott's today for your complete Cricket Infestation Solution!